The famous frontispiece of Hobbes’s Leviathan was inspired by the anamorphic art form, which originated during the Renaissance and remained popular during Hobbes’s lifetime in the 17th century. 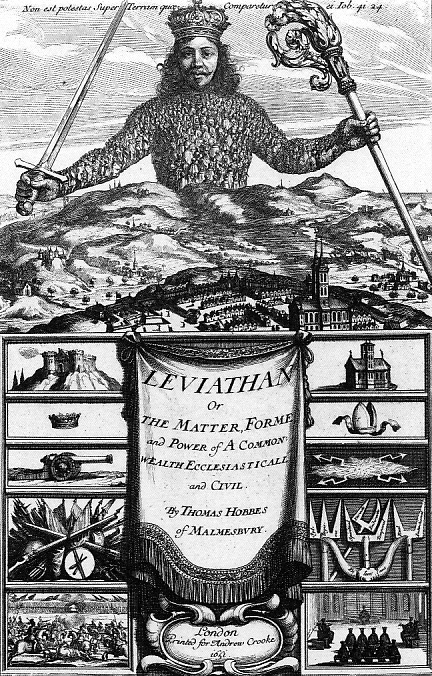 This iconic image offers multiple representations that provide the viewer with access to many of the core themes of the Leviathan: At the bottom are juxtaposed competing, or perhaps balancing, sources of Sovereign Authority—images of Ecclesiastical Authority (on the right) and Human/Temporal Authority (on the left). In the grand center is the figure of the Sovereign King, whose body is both literally and figuratively constituted by the blurring-together individual bodies of the citizenry, the co- signers of the social contract, who face away from the viewer and towards the Sovereign. One discovers, in this image, the notion of Sovereign Authority as an Artificial Person built up from the consent of the multitude of Natural Persons. It well illustrates Hobbes’s theory that, “A multitude of men, are made one person, when they are by one man, or one person, represented; so that it be done with the consent of every one of that multitude in particular” (Hobbes, Leviathan, I.16.13).